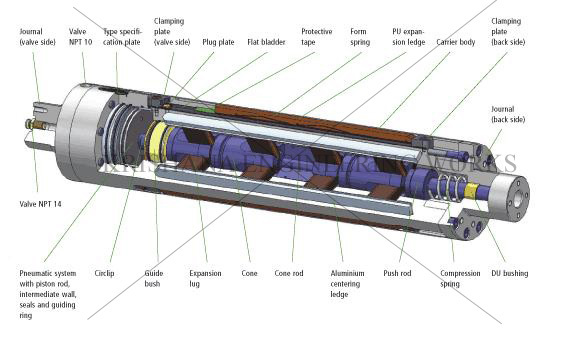 This is a lug type shaft but core holding is initiated mechanically and not pneumatically. This shaft mainly consists of slotted pipe, steel lugs, brass cam, ratchet etc. The shaft is capable of taking any challenge arising out of heavy load and speed. It is possible only because of positive gripping and core centering achieved without any extra efforts with the help of cam/lug design. It is very much advantageous with cores having uneven inside diameter. Key and alien-cap bolt prevent any shearing of journals – pipe assembly. Suitable for Core ID. 3″ and 6″.